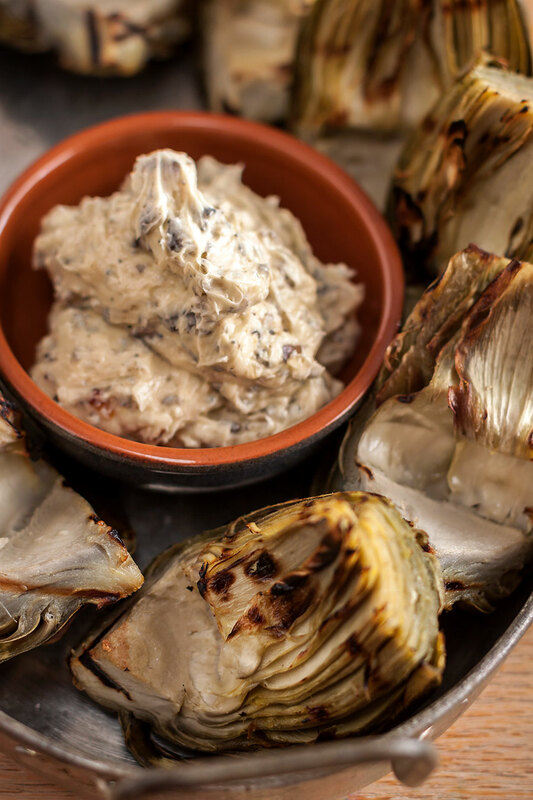 From now on, whenever we cook artichokes, we’ll be finishing them on the grill. A quick trip to the grill transforms the prickly domesticated relative of the thistle into something altogether more subtle and flavorful, with a deep smokey intensity that soars above the simple steamed version. Grilled artichokes are easier to eat, too. Once the artichoke has been steamed, it’s a simple matter to quarter it and pull out the fuzzy inedible “choke” and inner leaves. After grilling, just pull off the leaves, dip them in your sauce of choice and drag the tender, meaty base through your teeth. And when the leaves are gone? You’re left with your reward – the satisfyingly firm heart of the artichoke. Accompaniments to artichokes typically include tasty (but predictable) garlic butter or a rainbow of flavored mayonnaise-based dips. 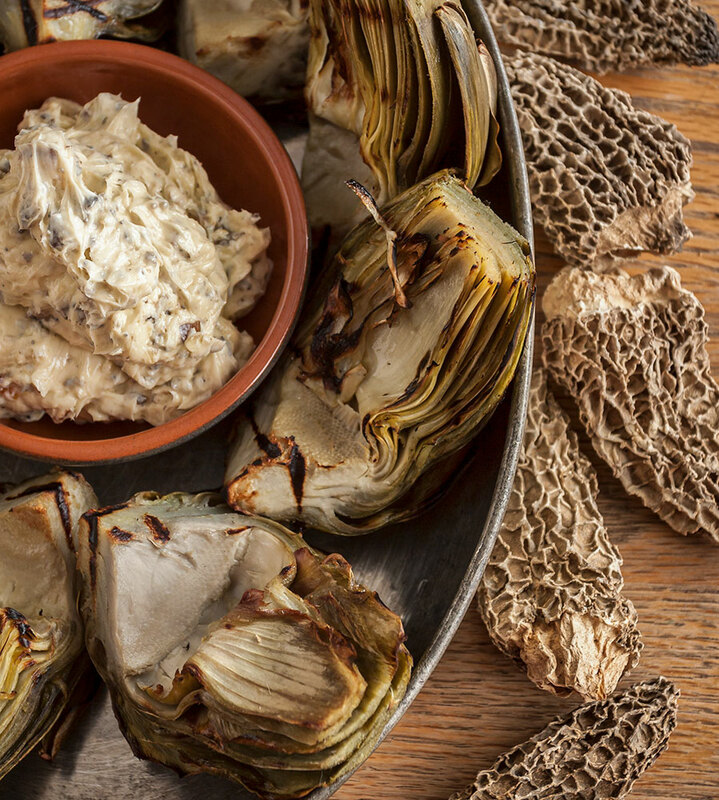 Instead of the usual suspects, why not dip your artichoke into something with a hint of the wild woods? Morel-date butter sounds unusual, but it’s a combo that really works. Dried morels, with their earthy intensity and subtle smokiness, meld deliciously with naturally sweet medjool dates in rich, creamy butter. A spike of freshly ground pepper adds a sharp counterpoint that only accentuates the flavors of the other ingredients. Morel-date butter, once made, stores beautifully for weeks in the refrigerator or for many months in the freezer. It’s not just for artichokes, either. A dollop of morel-date butter is the perfect finishing touch for a fillet of grilled fish, a mound of mashed potatoes or a bowl of steaming polenta, creating a rich, buttery sauce as it melts. Spread a little taste of spring wherever and whenever you choose with easy to make, even easier to use morel-date butter. Place a steamer basket or rack into the bottom of a large pot, big enough to hold all of the artichokes in a single layer without crowding. Add enough water to come up just to the bottom of the basket. Bring to a simmer over medium heat. Wash the artichokes under cold water and cut the stems an inch or so from the base of the artichoke. Pull off the lower, tough leaves from around the base of the stem. Cut off the top inch of the artichoke and rub with a slice of lemon to preserve the bright color. The thorny tips of the leaves may be trimmed flat with scissors, but it’s not really necessary. Place the artichokes into the steamer basket or rack, bottom side up. 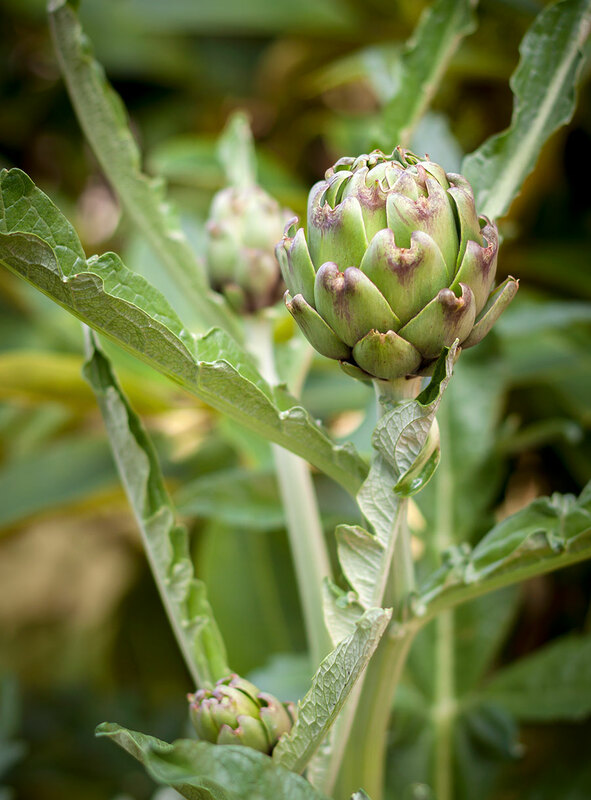 Top the stem of each artichoke with a thin slice of lemon to prevent discoloration. Squeeze any remaining lemon into the steaming water. Cover tightly and reduce the heat to low. Steam medium artichokes for 30 – 35 minutes, larger artichokes for 40 – 45 minutes, or until a leaf can just be pulled away from the artichoke without too much difficulty. Remove the pot from the heat and set aside to cool with the lid slightly ajar. When cool enough to handle, remove the artichokes from the pot and put on a plate, bottom-side up to drain and cool. The base of the artichoke should be tender, but firm – not soft and soggy. When cool enough to handle, cut each artichoke into quarters lengthwise. Scrape out and discard the fuzzy center and innermost leaves. Brush the cut sides of the artichokes with a little olive oil, season with salt and pepper and grill, cut-side down, until lightly charred, about 5 minutes. Turn and grill briefly on the other cut side, then turn again onto the back. Serve warm or at room temperature with morel-date butter for dipping. Make ahead options: The artichokes may be steamed up to two days in advance and stored tightly covered in the refrigerator. Remove from the refrigerator shortly before grilling to warm slightly. If you’re not already using dried morel mushrooms, you should be. 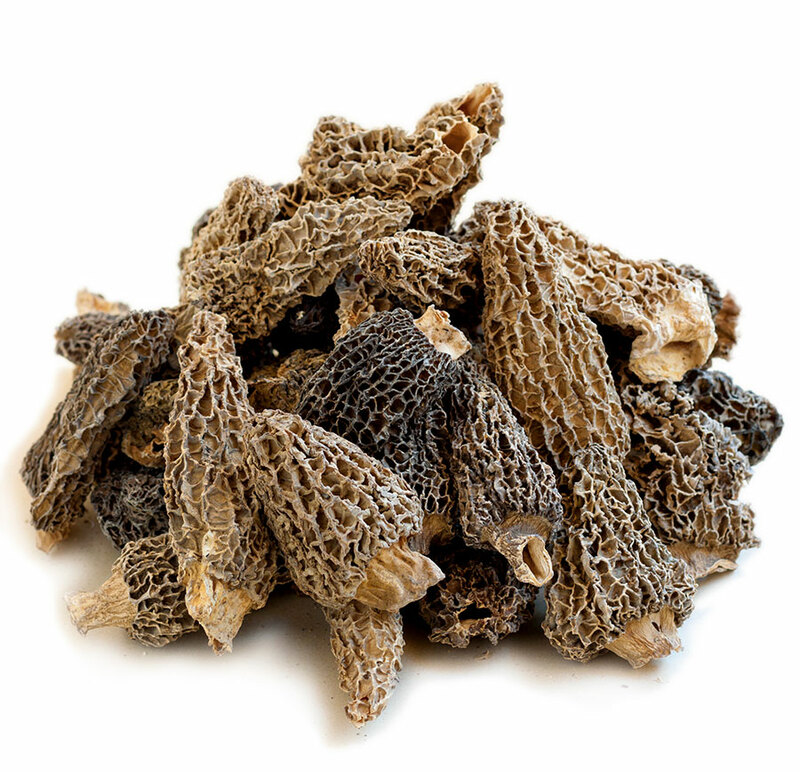 Savvy mushroom lovers know that dried morels pack intense flavor into a small, easy-to-use package. The drying process concentrates and transforms the natural earthiness of fresh morels into something magically different. Like other dried mushrooms, dried morels can be stored for many months and are ready to use any time – even long after the season for fresh morels has ended. Pit the date (if unpitted) and chop coarsely, place in a small bowl and pour over the Elixir of Morels or dry sherry. Set aside to soften. Place the dried morel mushrooms in a heatproof bowl and pour boiling (not hot) water over them to cover. Allow to stand for 15 minutes, then drain, rinse and chop coarsely. You should end up with a tightly packed 1/4 cup of chopped reconstituted morels. Heat the olive oil in a small pan over medium heat. Add the shallots and reconstituted chopped morels and cook, stirring frequently, until the shallots become slightly translucent and softened, 3 – 4 minutes. Remove from the heat and set aside to cool. Put the softened butter into a small food processor and pulse until smooth. Add the morel/shallot mixture and the chopped dates and season with salt and pepper to taste. Hint: don’t skimp on the pepper – it really accents the flavors of the morels and dates. Run the processor just enough to incorporate all the ingredients; you’ll want to leave some bits of morels and dates for interest. Allow to stand at room temperature for an hour or two to let the flavors develop. Use soft as a dip for artichokes and other vegetables or as spread on bread, muffins or bagels. Storage tip: If you have extra butter left over (as if! ), it’s easy to save the remainder by freezing it in a “log.” Here’s how. Cut a piece of plastic wrap, about 12 x 12, and lay it flat. Using a spatula, place dollops of the processed butter along one edge of the plastic wrap. Roll the butter up in the plastic wrap so it forms an even log or sausage shape (don’t worry if it’s not perfect – it will all even out). Twist the ends tightly. Using a sharp knife or skewer, prick the plastic wherever there is a bubble to let the air escape. Place the rolled up butter into the refrigerator to chill & firm up. For best results, use the following day after the flavors have had a chance to blend and meld. Morel-date butter may be stored in the refrigerator for a week or more and can be frozen for many months. Simply slice a round off the log to top grilled meats, seafood or poultry for a quick & easy sauce, or top potatoes, rice, polenta or vegetables while hot.